Right now, the highest resolution desktop display you can get for a PC is a 30-inch monitor that runs at 2560 by 1600 pixels--about four megapixels. If you want more than that, you can have multiple monitors, but the bezels tend to break immersion on gaming or simply get in the way for productivity apps. Now think about doubling that resolution to 8 megapixels on a single display. Even if you could buy one, the cost would be substantially higher than that $1,200-$2,100 30-inch LCD. Alternatively, you could take four 1080p projectors, each about $1,000. Use them to project onto a single, curved surface much larger than a 30-inch display. Aligning and merging the images manually, in a way that accurately responds to the changes in the desktop or high frame rates in games, can’t be done manually. Companies like Scalable Display Technologies and Mersive are working to solve this problem. The technologies developed by these companies first breaks up the image into multiple tiles. Each segment is then projected onto a large screen, sometimes curved, sometimes flat. The images from the different projectors need to be blended, color balanced and calibrated to create a single, large image. While the two companies overlap somewhat, Scalable Displays seems to be focusing on smaller scale solutions while Mersive goes after huge venues. The idea in both cases isn’t to create displays for a single desktop user, but to build high res setups for larger venues. For example, NEC has licensed Scalable Display’s technology to build a theater-style product that replaces a single, $100,000 projector with four projectors costing about $10,000 each. The entire affair generates 2,500 lumens. The company has also built an “enterprise media wall” with system integrator Cynergy for a Fortune 20 company that uses one PC, no external hardware and two HD projectors. The PC runs Windows 7 and a capture card for a complete, large scale video conferencing solution. Mersiv’s CEO Robert Belgley discussed one project that involved a display 32 feet wide, 20 feet high and used 20 projectors, creating a huge, 55-megapixel display. At one point, this the highest resolution large display in public use. Both companies use GPU technology to handle the compositing, color correction and tiling of the images. With smaller scale units (up to six projectors), a dual GPU solution can still generate 30 or more frames per second of real time animation, such as a game. Mersiv’s products are built into large scale ship simulators for the US Navy, for example. 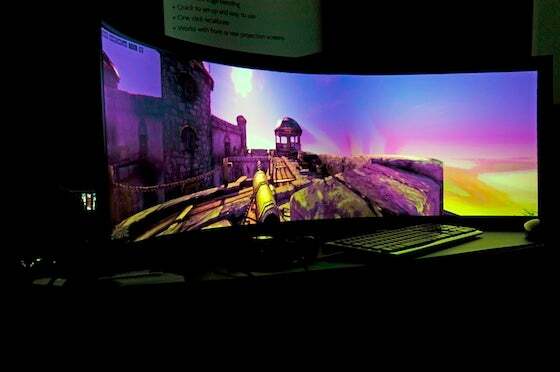 Scalable Technology has shown two, three and six projector curved displays that could be used as an immersive gaming setup. What’s unique is using software and multiple projection sources to build these very high resolution displays that create a seamless image. As projector technology evolves, and higher output, higher resolution pico-projectors become more common, you could envision a big curved, quad-HD screen on your desktop at roughly the price of two or three 30-inch monitors. Now that would be an immersive gaming setup.